Links Like This is an extension for the Mozilla Firefox Web browser that helps you open sets of similar links in tabs all at once. 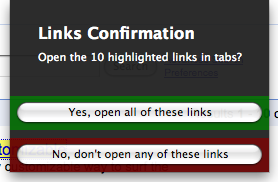 When you right-click on a link and select “Open Links Like This…” from the context menu, it highlights the other links in the page that are similar to the link you clicked on, and it will then ask you if you want to open the highlighted links in tabs. I was looking for an extension to open multiple links at once in Firefox. 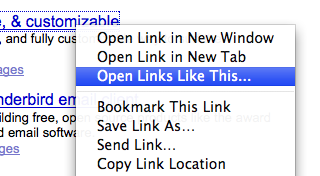 Since ‘Snap Links’ doesn’t work with Firefox 3.0b2, I was looking for another solution. That’s how I found your extension. Do you have the time to improve this extension? FYI – Can’t get this to install with Firefox 3.0, first release candidate. This is incompatible with Firefox 3.0 final release. Can you please update it? It’s a great extension and I miss it. I hope that your developing of this great present must go on and on. How are the similar links selected?? If i knew this i’d know where & how to use this handy add-on for Firefox. Is there any way to highlight the key part to use as the similarity for all the links in a page? Kaliteli ve taze Ã§iÃ§ekler ile Ä°stanbul’un her semtine Ã§iÃ§ek sipariÅŸi verebilirsiniz. SipariÅŸiniz 60 ile 180 dakika arasÄ±nda teslim edilir. Your add on is very useful. but i want to copy links not opened. its possible. try to update. this is most want one. suppose you update this feature, inform me via mail. This addon no longer works for me on Firefox 22. The option is simply not present in the right-click menu. I’ve submitted an update to AMO; it should be available shortly.